Congratulations to Sue Herrmann on winning our 173rd High Five Giveaway! Thanks to all who entered. For our next High Five Giveaway we have a $50 gift certificate to RPM Italian. RPM Italian presents cuisine that is modern in approach and Italian in spirit, with dishes intended to be shared. Chef partner Doug Psaltis has created a menu which features a variety of cold and hot antipasti, more than a dozen freshly prepared in-house pastas, and a selection of salads, prime steaks, chops and slow-roasted meats. The restaurant also has an open bar area where guests can order a signature cocktail created by acclaimed bartender Paul McGee, or enjoy a glass of wine from their extensive list. Sophisticated and chic, RPM Italian is perfect for a great meal or late night out. RPM Italian is located at 52 West Illinois, Chicago, IL. 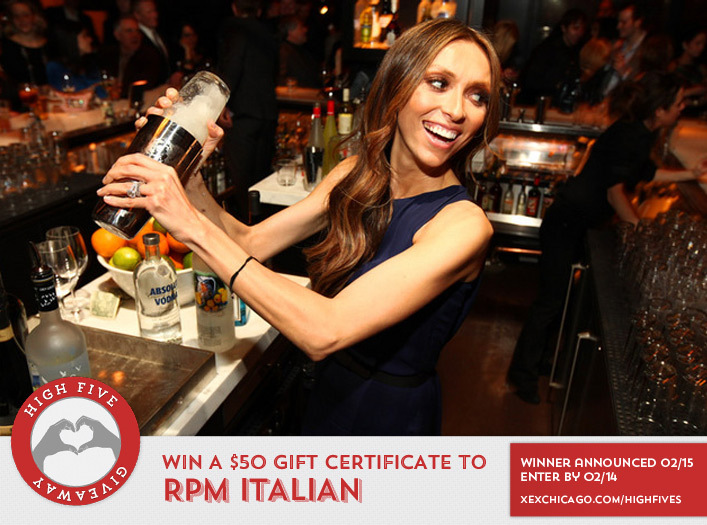 Visit their website at www.rpmitalian.com or call them at 312.222-1888 for more information. What XEX team member did the make up on the video we posted on Facebook today, January 16? Hint: Check out our Facebook page for the answer! Now, just add a comment to this post with the right answer to be eligible to win! The winner will be announced on Wednesday, February 15. Enter by midnight on Tuesday, February 14! All individuals 21 and older are eligible, whether you are a client of XEX or not. Must be able to pick up the gift certificate at XEX, 35 West Wacker Drive, Chicago within 30 days of winning. Leaving a comment opts you in for the XEX email list, which is sent out 1-2 times per month. You may unsubscribe at any time.